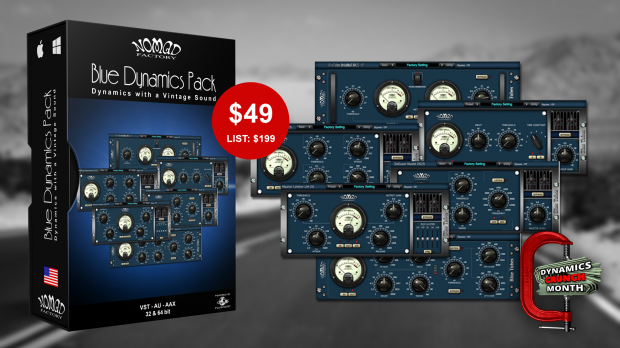 The Blue Tubes Dynamics Pack has the best sounding emulations of the warm sound qualities of classic dynamic analog hardware all in one pack. Now on sale during “Dynamics Crunch Month” at 75% off the list price. Designed by musicians for musicians, the Blue Tubes Dynamics Pack is a collection of 6 plug-ins processors designed to improve the quality of digital sound recordings. This bundle recreates the warm sound qualities of classic dynamic analog hardware. The sound quality of Blue Dynamics pack is nothing short of amazing. Yet all 6 plug-ins provide a simple and functional vintage-style interface, as well as low CPU consumption for lightening-fast processing. This entry was posted in DontCrack, Plug-ins, Promotions and tagged Blue Tubes Dynamics Pack, BT BrickWall BW2S-XP, BT Compressor CP2S, BT Compressor FA770, BT Limiter LM2S, Nomad Factory. Bookmark the permalink.